Egg salad is one of those dishes that is a breeze to whip up and extremely versatile. In other words, it's a "back-pocket" recipe - one you can pull out at a moment's notice. I may have eaten my weight in egg & cress sandwiches while pregnant and living abroad. On every local tea room menu, I could find those lovely dense sandwiches with the layer of peppery cress...and I tried them all. The thing with egg salad is it takes on the flavor of whatever is put with it. I like bright classic English egg salad with that bite from the cress. Then again, I like a traditional Southern egg salad that tastes a little more like deviled egg filling. Moreover, I like smoked salmon and dill mixed in my egg salad. Let's just assume, that I will eat any egg salad sandwich that you put in front of me...unless it has Marmite on it. I cannot stomach Marmite. Other than that, we're good. You can go the ethnic route and flavor it with Mexican spices (eggs hold up really well to spicy flavors) or like I have done here and gone the Indian route. As much as I like a good sandwich, egg salad does always look pretty in hollowed out tomatoes or lettuce cups. Roughly chop the boiled eggs and set aside. Pour over eggs and mix well. 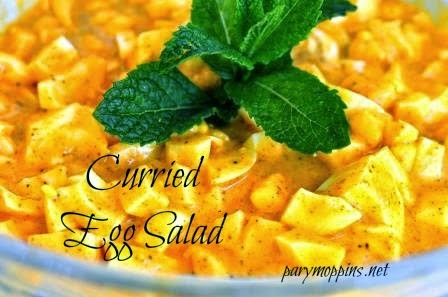 Julie, this sounds wonderful- I love curry, mango and yogurt, but who would have thought to have combined them into one delicious bowl? Thanks! :) PINNED! Ooo I think I'd enjoy this. I love egg stuff.